Evidence that thousands of offences by Scottish fishing boats have gone unpunished has prompted accusations that the industry is being “let off the hook” by the Scottish Government. An investigation by The Ferret has uncovered official figures suggesting that on average more than 1,700 offences a year have resulted in just 24 fines of £2,000 each. The vast majority of fishermen were given no more than a verbal or written warning, even if they were repeat offenders. Environmental campaign groups warned of a “culture of non-compliance” causing fish illegally trawled from conservation areas to be sold alongside legal catches – so-called “grey fish” – and damage the reputation of Scottish seafood. According to the government, however, most of the offences were “minor”. Data released by the Scottish Government to the European Union’s court of auditors showed that inspectors found 5,150 infringements of fishing regulations by the Scottish fishing industry from 2013 to 2015. This is an average of 1,717 infringements a year over three years. The regulations include limits on catches and quotas from particular fisheries to conserve stocks. There are also rules restricting access to certain waters at different times, as well as controls and technical measures to limit fishing capacity and the use of vessels and gear. The EU auditors pointed out that 169 of Scotland’s 2,000 fishing boats each had more more than five infringements between 2013 and 2015. This was a much higher proportion than fishing boats in Spain, France or Italy, they said. The number of fines imposed in Scotland was “very small”, the auditors observed. “In practice, most of the action taken following infringements involved advisory letters and verbal and written warnings,” they added. 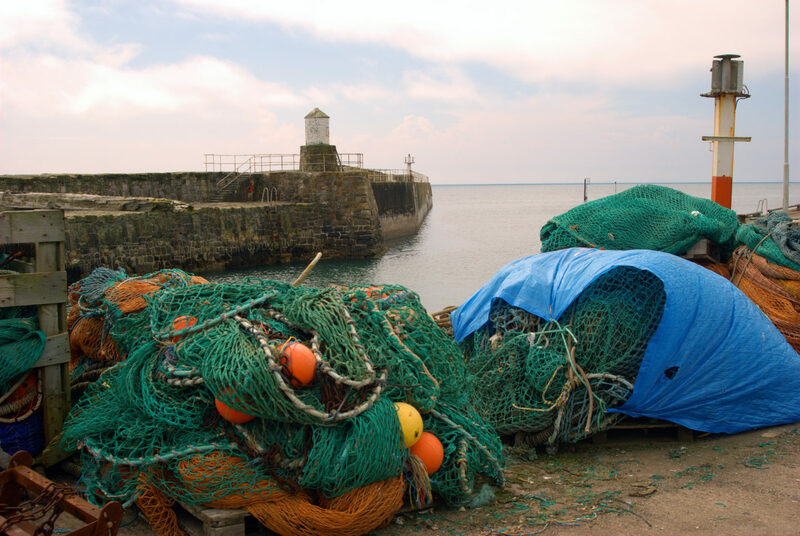 Inspection efforts and coverage in Scotland were higher than in other countries, but the re-offending rate by the fishing industry was greater. This indicated that Scotland’s sanctions were “less dissuasive”, the auditors concluded. The Scottish Government has also released information about fines imposed on the fishing industry under the Aquaculture and Fisheries (Scotland) Act 2013 and related legislation. It shows that boats were fined an average of just over £2,000 for 96 offences from 2014 to 2017. The offences included breaching quotas, under-declaring catches, landing undersize fish, fishing in closed areas and electric fishing for razor clams. In ten cases the fines were only paid after a prosecution, another five prosecutions were unsuccessful and seven court cases were listed as “ongoing”. The average number of fines imposed per year was 24, with 16 in 2014, 18 in 2015, 39 in 2016 and 23 in 2017. But according to campaigners, far more offences escape punishment because of “soft prevention” by the government’s Marine Scotland. 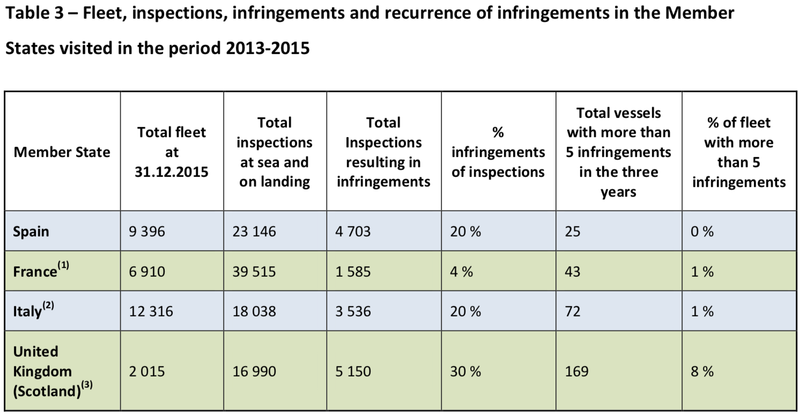 He pointed out that nearly a third of inspections had found infringements of fishing rules. “Fishing offences are a serious matter as they risk undermining the health of our seas and consumer confidence,” he argued. “People expect seafood to be sustainably and legitimately caught. They do not expect there to be any risk that the prawns on their plates could have been illegally trawled out of a marine protected area,” Underdown added. Underdown pointed out that the maximum fine for fishing in a marine protected area was £50,000, but that recent breaches were only penalised with a “paltry” fine of £2,000. “Marine Scotland is letting fishermen off the hook,” he declared. Underdown urged Scottish ministers to set up a tracking system to cover the 80 per cent of fishing boats that go unmonitored. “It’s now time they got serious about compliance,” he said. Two responses from Marine Scotland under freedom of information law say that there have been over a hundred reports of suspected incursions by fishing boats into eight marine protected areas since 2015, some of which relate to the same incidents. So far there has reportedly been just one conviction. In February 2018, divers filmed evidence of illegal scallop dredging in the Firth of Lorn, a protected area to the south of the island of Mull. The matter was reported to be under investigation by Marine Scotland. The Ferret has discovered that Marine Scotland is now investigating another allegation of illegal trawling in a wildlife area off the Isle of Arran on 31 May. “Marine Scotland Compliance has received reports of a trawler operating within the South Arran marine protected area, which are being investigated,” said a government spokesperson. The Scottish Government, however, refused to say how many alleged breaches of marine protected areas were currently under investigation. “There are investigations currently live but we can’t go into details,” said the spokesperson. The Community of Arran Seabed Trust (COAST), a local marine environment group, accused Marine Scotland of being unfit for purpose, with only one dedicated inshore patrol vessel covering 11,550 miles of coastline. “They are letting honest fishermen down”, said COAST director, Paul Chandler. Chandler accused Marine Scotland of “poor enforcement” of repeated violations around Arran. “This is unfair on the majority of fishers who fish legally and want to restore our inshore waters to the flourishing environment and fishery which they once were,” he said. The Scottish Government insisted that it took fisheries compliance very seriously. “All breaches of fishing legislation are fully investigated and, where appropriate, the offence is reported,” said a government spokesman. According to the Scottish Government, all reports of suspected infringements were investigated “to the extent that the evidence provides”. Some reports turned out not to be infringements, and some were duplicated. Some infringements resulted in “soft measures such as verbal debriefs of advisory letters” because there wasn’t enough evidence to go further, the government suggested. Others were investigated further and sometimes led to tougher sanctions. The industry body, Seafish, stressed that the great majority of fishermen in the UK did not break the law. “They work hard to ensure their catch is sustainably caught and quotas of fish are healthy for generations to come,” said Seafish head of responsible sourcing, Helen Duggan. She pointed out that the report by EU auditors highlighted that it was often the same vessels re-offending rather than an industry-wide issue. “These numbers could also be said to reveal the robustness of the inspections in Scotland compared to the other EU member states,” argued Duggan. Seafish launched a responsible fishing scheme in 2016 requiring skippers to demonstrate that they were caring for the environment. “Vessel membership of this scheme continues to grow ensuring the UK industry is a global leader in responsible and sustainable seafood sourcing,” she said. The Scottish Fishermen’s Federation declined to comment. The cover image on this story was changed on 4 August 2018 in response to a request by a fisherman.